Is it a DeLorean, and who drove it past the clock tower when it got struck by a bolt of lightning? No, you’re not dreaming: the board in the picture above is a Division II (D2), last seen in competition at the Barcelona Games in 1992. The rig, a 7.8m2 RS:One rig from Neil Pryde, was first produced in 2011. And the ‘kid’ visibly bored to death on this unusual combo is Frenchwoman Faustine Merret, Olympic gold medalist at the 2004 Games in Athens… on the Mistral One Design. And there you have it: a beloved windsurfing class that was picked as the Olympic sailboard class the year Mark Zuckerberg used a Macintosh 128K to prop himself upright and walk his first steps, is brought back to life by facebook! 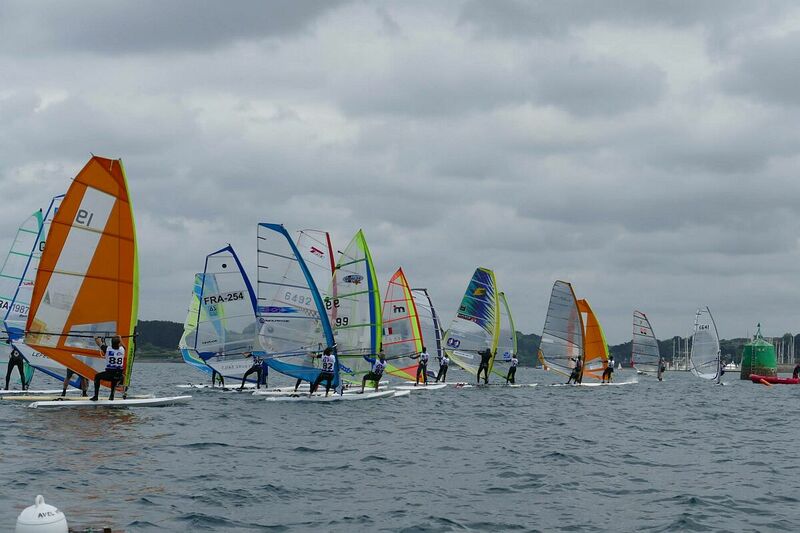 And now the D2 Class is the new kid on the block, the latest full class member of the International Windsurfing Association, with 1,000 members on facebook and a flurry of clinics and events on the calendar. 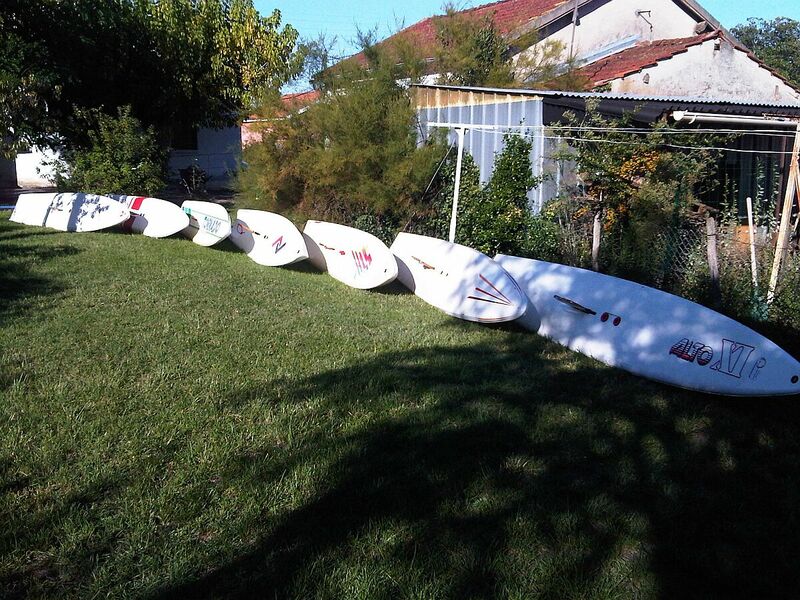 With the introduction of a ‘Category C’ race division (up to 9.5m2 sail sizes for men and 8.5m2 for women, with no restriction on shape and design), you can now hop on a D2 board and race with your trusted rig. Check the group picture above – you’ll even see an RS:X Evolution sail in there (part of an early Neil Pryde proposal for the 2016 Rio Games, as you may tell from the Brazilian color theme)! We know you’re antsy to check whether you still have the centerboard for that L3 Lechner you have stashed away in the garage, but before you do, brush up on this fascinating part of windsurfing history and check out Eric Bouillet’s write-up: The Revival – Back to the Future. OpenDiv2 facebook page, the page that (re)started it all! 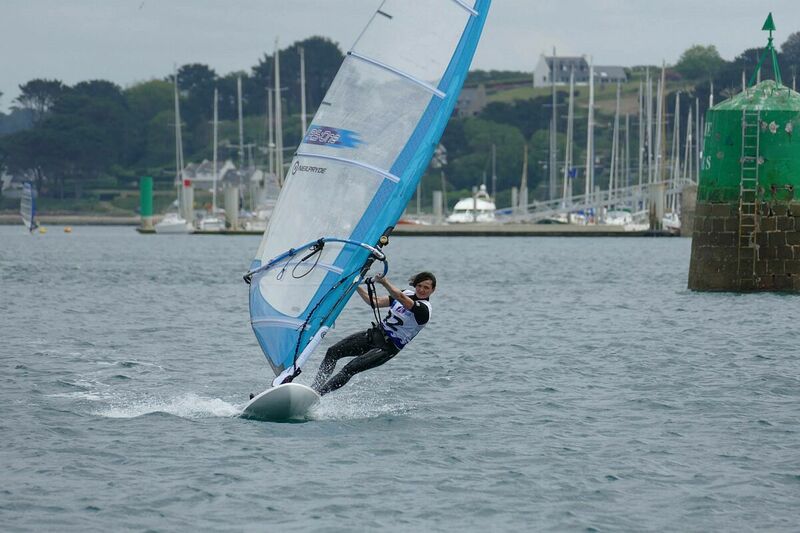 Superb photo album from Ann Miossec Smewing at a recent event in France. A blog by Francois Schricke full of pictures of recent D2 repair projects, tips and media articles from the early days. 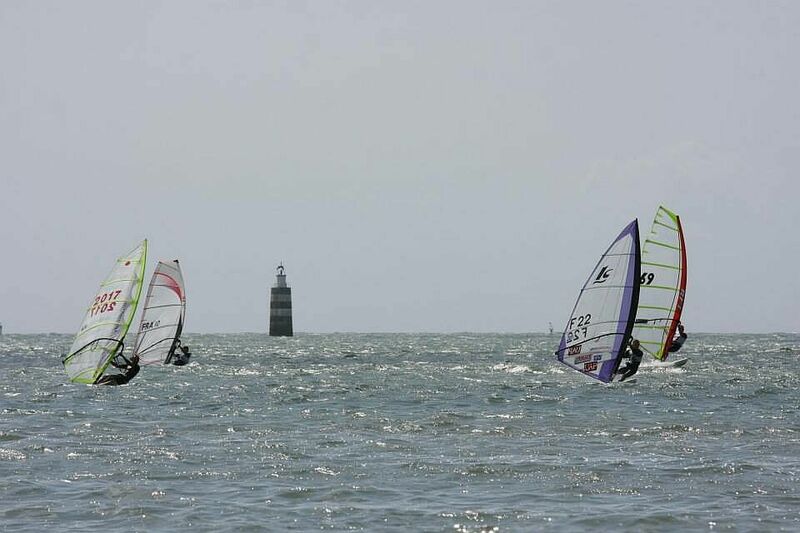 And come join the party at the 2015 US Windsurfing Nationals! Dear friends!! I used to race back in the early 80s. Now I own a LECHNER DIV.II, which I bought 16 yrs ago, from Nikolas Kaklamanakis himself. It is such a magnificent board and I enjoy riding it. I also have been in touch with smn that owes a TORNADO 39 D.II. and I intend to buy it too. !! like. I ride with D2 in. Portugal. Hope you join us soon on our FB Open D2 page ! Where do you sail in Portugal? One sailor up in Puget Sound, who shall remain nameless for now, rides a modified D2 in local races on Puget Sound. If the wind is light, he beats the pants off every other longboard out there. He also sailed it in the recent Port Townsend to Alaska sailing craft race. He bested a lot of boats. I would love sailing near Seattle…Is he alone sailing D2? I just discover your message..one year old..Really sorry. Next story Maui Race Series in Full Swing! Previous story Kona on the west coast this summer!